20 MARTIN PLACE - Projects - James Carpenter Design Associates Inc.
JCDA’s design builds upon the classic modernity of the building’s underlying steel and concrete structure, investing the highly technical but understated glass façade with a level of detail and materiality equal to the surrounding historic buildings’ craftsmanship. 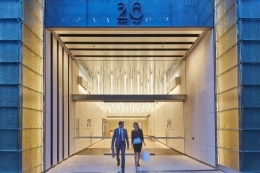 JCDA was the lead design partner re-envisioning the 20 Martin Place tower. As part of this 1970s commercial building’s transformation, only the 20-storey existing steel frame structure was saved and a new core, slabs and enclosure were built. The new lobby and storefront and curtainwall advance the tower’s integration into the architectural landscape of downtown Sydney, while incorporating a fresh aesthetic that uses glass to create a luminescent presence. An innovative cladding system composed of overlapping rows of glass panels channel and diffuse natural light from the building’s southern façade, creating an iridescent effect that responds to changing light conditions of Sydney’s urban environment. This same thoughtful application of light and glass are evident in the interstitial spaces that connect the tower with the podium at its base, which incorporate glass vitrines and cast glass columns to activate the public realm at street level. The interlocking connection between the tower's shaft and podium draws on Sydney’s historic architectural traditions, while enlivening the space with an infusion of light and materiality. The design activates the podium as a reconfigured civic space that seamlessly enhances both the tower and the surrounding urban landscape.